Ade sees the future. Unfortunately the only way he can see that glimpse is through having a massive concussion. Oh sure, it used to be easier, but as time has passed Ade has had to go to greater and greater lengths to get that peek into the future. Even worse? He's addicted to the high that only that can produce. This is the character that we follow through Future Imperfect and I'm not kidding when I say that his head is a very strange place to be. Ade is like a walking case study for addicts. Although his addiction happens to be to concussions, his habits really show those of any person who is an addict. Ade's brain is addled, and the reader takes a seat in it as the story progresses. I'll admit that this book really took me a while to fully appreciate. The situations that happen are so messed up (trust me there isn't another way to describe it) that I often couldn't fully wrap my mind around what was going on. Ade's relationship with his mother is an odd one, and then when Vauxhall enters the picture things get even weirder. It isn't that I didn't like Ade. I understood him as an addict, and I saw him as a person who is kind of lost in their own mind. However I had such a hard time actually feeling like I was a part of him, that being in his brain was disconcerting and made the story kind of hard to read. By far my favorite part of the whole story was when Ade sees a potentially violent end to someone he knows when he glimpses the future. It is at this point that his whole being kind of changes, and I began to see more into the Ade that was trapped under his addiction. As the story nears the ending, things clear up, the reader sees more of the real world that Ade lives in, and honestly I started to feel more a part of him than I did before. However it took so long for me to get to that point that I really had a hard time enjoying the book as a whole. If I'm rambling, I apologize. 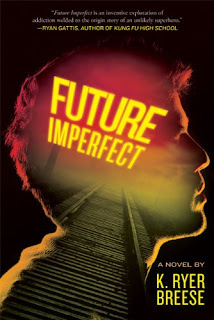 The truth is that Future Imperfect was definitely a wild ride, but honestly one that I don't think I was fully prepared for. This book is one of a kind for me this year. It is unlike anything that I've read so far. I was really hoping that would be enough to keep me invested. However there were just some parts of this book that were so out there, I admittedly felt a little lost. I think there is a lot to love, and I'm sure that there are plenty of readers out there who will throughly enjoy this book. Ade and Vauxhall have their quirks, but their story is definitely fascinating. I say give it a try. You might find something you love! FTC Disclosure: I received a review copy of this book in exchange for a fair and honest review. I was not monetarily compensated for my opinion.